The homeless woman found walking around Taguig City with a bag reported to have been filled with cash worth of more than 70 thousand pesos was finally reunited to her family on October 29. Her mother and siblings came to picked her up in Bagumbayan’s Barangay Hall and explained that she had been missing for a week. For one week, the 54-year-old woman was taken care of by the barangay health workers in their barangay hall. They washed her and open her bag to get her some clothes when they found out that the bag contains cash. People could not contain their surprise and even caught the media’s attention. After seeing the news report on TV, her family immediately went to the said barangay hall. It turned out that she had been missing for to weeks since she had a misunderstanding with one of her siblings. Her family was worried and shared that the woman suffered depression after she found out that her boyfriend in Ilo -ilo whom she had been sending money to, was already married to another woman. She was unable to speak and eat when he finally She had been taking therapy for her depression and was scheduled for the third one when she got missing. The money in her bag consists of bills, coins and other currency. Her family said that the money is her savings when she was still selling ice candy, soda, and the like. While some speculated that the money had came from a gambling, some of her customers spoke up and said that they had seen the woman working hard selling ice candy and such. 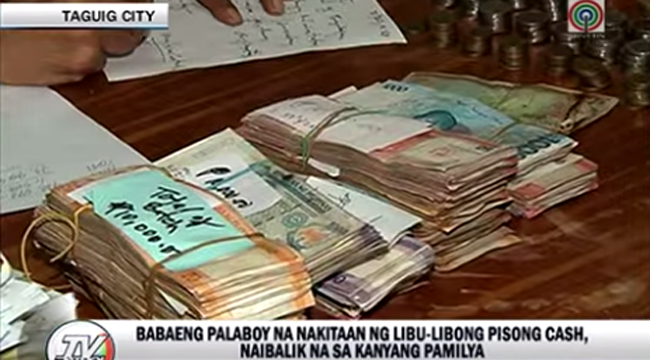 The barangay officials also gave the family the money that they had counted in front of them. The family said that the money will be used for her therapy. They thanked the barangay workers and those who took care of their missing family member.